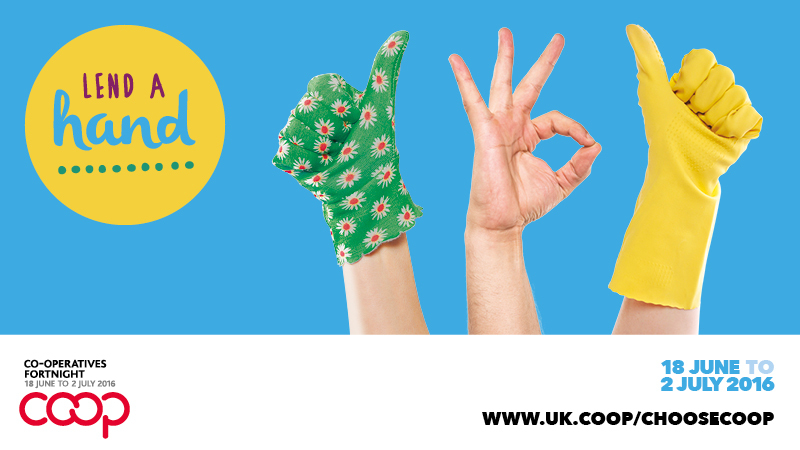 Building on last year’s success, the theme for Co-operatives Fortnight 2016 – which runs from 18 June to 2 July – will once again be the Big Co-op Clean. Co-operatives up and down the country will be lending a hand and organising clean-ups of public spaces in their local areas. Co-operatives Fortnight is the co-operative sector’s annual campaign, a two-week period when co-operatives of all shapes and sizes come together to encourage people to choose co-operative. Organised by Co-operatives UK, sponsored by some of the country’s most successful co-operatives and brought to life by co-ops nationwide, Co-operatives Fortnight is the perfect time for co-operatives to showcase that they are a co-op. Launched in 2010, Co-operatives Fortnight has gone from strength to strength. Last year the Big Co-op clean was introduced as a focused activity that co-operatives of all kinds could organise. Over 100 co-ops participated in organising clean-ups of local parks, river banks, beaches and public spaces, or encouraged their customers to clean out their cupboards and donate to foodbanks. Hannah Nadim, the Chair of the Fox and Goose, a co-operative pub in West Yorkshire, added: “The 2015 Big Co-op Clean was a great opportunity for us to work with like-minded people and at the same time improve our local environment. The worker owned co-op Unicorn Grocery in Manchester also organised a Big Co-op Clean. Kellie Bubble, a director of this business, said: “Co-operatives Fortnight is always an opportunity for us to shout about how proud we are to be part of the co-operative movement, but last year is one we also truly enjoyed. This is a great idea, never heard of it before so thanks for sharing. It would be great to see the before and after photos to see all the hard work put in.